Matagorda and its sister resort, Los Pocillos, are just over a mile from Lanzarote's large, bustling holiday city of Puerto del Carmen. It is also connected to the larger, more brash resort by a pleasant, long promenade walkway with great views over Matagorda Bay. This means that visitors who opt for staying at a beach house or in the quieter environs of Matagorda, a former fishing village, can easily access the more boisterous entertainment and nightlife of Puerto del Carmen. Matagorda has a gently sloping beach of fine, dark sand, particularly popular for windsurfing. It boasts a commercial centre with a fair choice of restaurants and a supermarket. In general Matagorda is ideal for those seeking a peaceful, relaxing holiday without too many bright lights or the usual beach resort crowds. Holidaymakers can take full advantage of the fact that Puerto del Carmen, Lanzarote and the rest of the Canary Islands enjoy a special duty-free tax status. Cigarettes, alcohol, perfumes and petrol are much cheaper than in mainland Spain and the rest of the EU. Matagorda has a two-storey shopping centre containing a supermarket and souvenir stores, but for a real shopping spree holidaymakers prefer to descend on neighbouring Puerto del Carmen, which is bristling with a variety for shops from duty-free electrical stores and designer boutiques to stalls selling 'tourist tat' such as beach buckets, spades, umbrellas and souvenirs along the main strip. The nearby town of Teguise hosts a vibrant Sunday market, which is fun to visit. Most of Matagorda's restaurants are situated in the central commercial area around a square, where holidaymakers can browse the displayed menus before deciding on their preferred cuisine for the evening. The choice is wide, ranging from Chinese and Greek to British and Japanese, with the usual pizza, pasta and grill houses thrown in. Most visitors rate it as a plus that Matagorda lacks the presence of 'PRs', reps or touts trying to lure diners into their establishments. Those who want a more extended choice or a livelier dining scene can simply take a walk or taxi ride to explore the nightlife and restaurants of larger Puerto del Carmen. Holidaymakers will find that although Matagorda is not lacking in waterfront pubs and bars, most offering some form of evening entertainment, generally nightlife in Matagorda is rather low key. Younger visitors looking for a taste of nightlife in Spain or a more vibrant night out opt to travel a short distance to the rollicking clubs and bars of 'The Strip' in neighbouring Puerto del Carmen. A wide variety of water sports can be enjoyed in Matagorda along the beach, especially windsurfing for which the area is a famed spot. 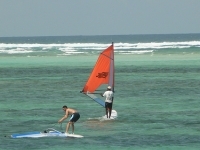 Alternatives range from banana boat rides and jet skiing to parasailing, scuba diving and deep sea fishing. Land sports facilities in the vicinity include tennis, squash, golf and horse riding. Rancho Texas Theme Park is a short drive from Matagorda and tourists wishing to get a real sense of Spain can opt to hire a car and explore the smaller villages inland. There are also several excursions on offer such as boat trips or visits to the dramatic Timanfaya National Park. Holidaymakers seeking bargains in Matagorda in electrical and photographic goods must be cautious and check their purchases before leaving the shop/stall. Many visitors have been ripped off. It is prudent to ensure that the guarantee on electrical items is a Worldwide or European guarantee as unscrupulous shops may try to sell products with only Asian guarantees to European visitors.